Guhagar is a quiet and secluded town, located in the Ratnagiri district of Maharashtra. It is situated at a distance of about 300 km from Mumbai. Although an offbeat location, the few tourists that approach this town is due to its quaint beach and small temples nearby. Guhagar's economy saw a rise after the construction of Dabhol Power Company. Along with this, hotels and restaurants came up in this region after observing the growing tourist interest. Guhagar can be visited throughout the year, however, the monsoon season might be particularly pleasant since all the rain-fed water bodies will be gushing with water. Lush green that surrounds these places will also gleam in its best form. A ferry can also be taken from MH SH 4 to reach Guhagar. Read further to know about the places to visit on the way. Durshet is a picturesque town settled on the banks of Amba River. It is known for being the place of war during Shivaji Maharaj's reign. Situated about 76 km from Mumbai, Durshet is a favoured destination for a quick getaway. Activities like trekking can be undertaken here, since it is home to Sarasgad and Sudhagad peaks. Pali Ganapati Temple can also be visited on a visit to Durshet. The way from Mumbai to Guhagar is dotted with popular forts like Mangad and Raigad fort. Mangad Fort is a distance of 70 km from Durshet while Raigad Fort is 92 km away from the town. The magnificent fort of Raigad was built by Chhatrapathi Shivaji, when he was crowned as the King of Maratha Dynasty in 1674. He made the place as his kingdom's capital. In order to strengthen the protection for the Raigad Fort, Chhatrapathi Shivaji Maharaj built numerous other forts surrounding the fort in Raigad. Mangad Fort is one such construction. Kashedi Ghat is a mountain pass, found on the highway that leads to Guhagar. It gives a beautiful view of the Konkan villages and the river Savithri, on the banks of which this highway is built. Interesting tales are tagged with the Kashedi Ghat. It is believed to be haunted since many people travelling through the road, have claimed to have had their backs or arms scratched, or their food stolen mysteriously! Perhaps it rises from the fact that the Kashedi Ghat has one of the most dangerous curves. After passing the Kashedi Ghat, about 56 km from the mountain pass will reach you to the small town of Chiplun. It is a mesmerising town that is accompanied by the river Vasishta and dotted with many places to visit. Sawatsada Waterfalls is a popular tourist destination, which looks particularly fantastic during monsoon. The gushing water makes the Falls look clear and white, a haven for photographers! Read on to know about the places to visit in Guhagar. 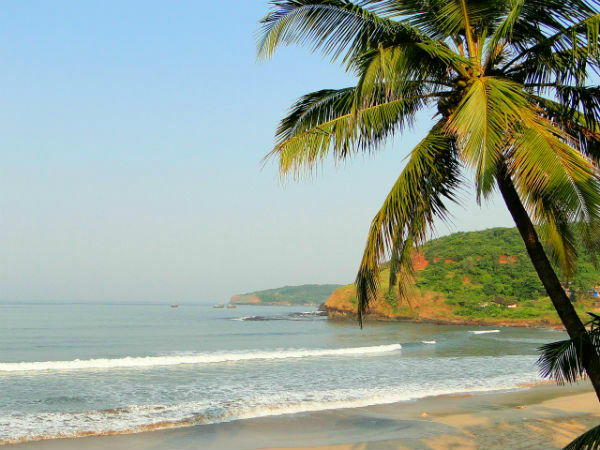 Unlike the many beaches that line the Konkan coast, Guhagar is home to a pristine beach that has glittering white sand. The clear and blue waters of this beach that are flanked with beautiful palm trees, makes it a haven for those who just want to relax in a tranquil atmosphere. Since it is an offbeat destination, it hasn't been touched by commercialisation. Although the beach is relatively offbeat, the Guhagar Beach offers some exciting water sport activities. Fun rides like jet skiing, banana boat riding, bumper riding, to name a few, can be played at the beach. These water rides are available all through the year except during monsoons. The ancient temple of Durga Devi is believed to be the family deity of many Chitpavan families of Konkan. The temple which has been recently renovated, is flanked with lush greenery. It is usually crowded with devotees during the Navrathri Festival. According to one of the local legends, Durga Devi fought and defeated negative energies and saved Guhagar overnight. A pillar is erected near the temple, which is believed to be the original place of the old temple. Velneshwar is home to another beautiful beach, that is now slowly gaining popularity amongst tourists. It is flanked with palm trees along with an array of beetlenut trees as well. Velneshwar is also known for a Shiva Temple. It is home to other shrines nearby which are dedicated to Lord Kala Bhairav and Lord Ganesha. During Mahashivrathri, the temple is usually filled with devotees. The small town of Ganpatipule, located 50 km from Guhagar, gets its name due to the famous temple. The Ganpati idol which dates back to over 400 years old is believed to have formed and arose right from the soil. The idol faces West, unlike the usual deities of other temples that face East. The reason for this is believed to be because it guards the western gates. Dedicated to Lord Shiva, the Vyadeshwar Temple is an ancient east-facing temple with a huge prayer hall. It is built in an architectural style known as Panchayatan. In this style of architecture, four shrines are built in four different directions, with the main shrine placed in the centre. In this temple, the four shrines are dedicated to the Sun God, Lord Ganesha, Goddess Parvati and Lord Vishnu, with Lord Shiva being the main deity.